Email is the best way to establish a commercial relationship with your customers. Not social media and not your blog. It’s email. If you think about the sales cycle as getting your customers to know, like and trust you, email is the “trust” part. But how do you get people to buy from you after you've “primed the pump” with email? Bring them to a landing page! First, let’s talk about how to get them on to your landing page in the first place. If you've established a regular email rhythm with your prospects, they’re probably used to getting valuable, non-commercial content from you, as well as some salesy content. The rule of thumb is about a 3 to 1 ratio of non-commercial content to sales-oriented content. The salesy content is very educational as well, but its main purpose is to sell your offer. You need to apply all your best sales-letter copywriting on your commercial email. Sell the benefits, not the features. Answer your customers’ objections. Provide testimonials. Increase the value so the price looks small in comparison. After you get people off of your email and on to your landing page, what then? To continue with the “know, like trust” concept, we need to add a “buy.” The landing page enables you to translate the “trust” into a commercial relationship with your customers. 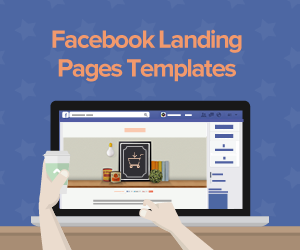 As we've discussed before, you need to create a different landing page for every campaign, persona, or product you sell. To manage every campaign that you send, there are many apps that can help you do that, we recommend to use Doppler, is the easiest way to fully manage all your Email Marketing campaigns. Each landing page has a specific purpose. Landing pages for your email marketing campaign are primarily to sell your customers a product or service. To help you create a successful landing page for your email marketing efforts, we've provided these five tips so you can close more sales. If you’re selling an online course on “How to Train Your Dog in Three Weeks,” and you've done a great job of selling the value of the course in your email, your landing page needs to have the same title. The reason is simple. You want maintain the “trust” factor. Trust is the basis for every commercial transaction. If your landing page has something completely different, or it’s not immediately obvious that they've clicked to a page where they can buy the “How to Train Your Dog in Three Weeks” course, they’ll quickly leave the page, confused and a little worried. Your landing page has to have a professional looking design that reinforces the trust you've built up with your prospects. Because you’re asking people for their credit cards, they immediately become more cautious. Their “fraud detectors” are very high. They need every assurance that you’re not going to take their money and run. A poor design that looks like it was created in 15 minutes is the best way to lose their trust. A professional looking design is one of the best ways to increase their trust. Sean D’Souza of Psychotactics talks about the yes-yes factor. Provide your customer with two purchasing options: your regular product at the standard price, and a second choice with an added bonus for a slightly higher price. Your customers are more likely to buy your product. Why is that? When you introduce an additional option, such as your product with a bonus, your customer will get excited. They WANT the bundled option for a slightly higher price. And you want your customer to spend more money with you while increasing your close ratio. We’re really harping on this “trust” factor here, aren’t we? Well, it’s really important. Bryan Eisenberg understands the needs for trust. 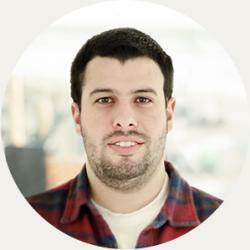 He introduce the term Point of Action Assurances, little trust icons that can boost conversion rates. These are the assurances that give your customers peace of mind. They can be logos from security companies such as Thawte, or the image of a little lock that tells them their credit card information will be secure. Your customers need that last minute assurance that their credit card number is safe just before they click the “buy” button. If you've done a great job in your salesy email, your customers are already aware of the many benefits of buying your product. They've read all the bullet points explaining what they’ll get, they understand how your offer is uniquely different, and you've answered their objections. But your clients are always afraid. They’re afraid they’ll make a mistake. They’re afraid they might be taking an unnecessary risk. How can you reduce the risk in your customers’ mind? Present them with a risk-reversal. Jay Abraham, whose name has become synonymous with risk reversal, says that when you take away the risk factor for the client, your sales will go through the roof. I really recommend you watch this Jay Abraham video about risk reversal. Creating a landing page for your email marketing campaign is all about continuing that trust so you can close the deal. 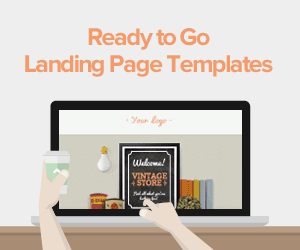 Your landing page needs to reassure your clients they’re in the right place. Your design needs to communicate that trust as well as your headline. You also need to get them excited about the choices they have. Present them with two choices: your standard offer, and a slightly more expensive offer with a bonus. This increases the chance they’ll buy, and it increases the chance they’ll spend more money. Then you need to reassure them again by providing them with those little trust icons. They don’t know you personally, and they don’t want their credit card number to end up in the wrong hands. Reassure them they’re safe with you. You need to let them know they’re not making a mistake. Take the risk away from them, and watch your sales go up. 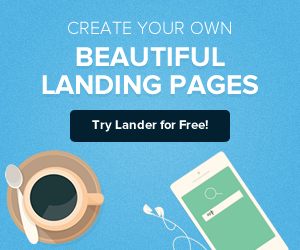 Finally we would like to remind you that with Lander you can easily integrate your leads with your email apps like Doppler, MailChimp, AWeber and Constant Contact. You can automatically pushes new leads to your email app, and can even send you an email alert for each new lead captured. 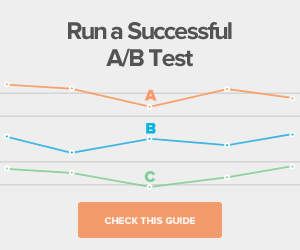 What are some of your email landing page successes? Let us know!